A bird's life isn't easy. A little over two weeks ago I was out walking along the bush track at Inskip Point when a bird flew across in front of me and then seemingly disappeared. When I followed around to the other side of the dead tree stump I saw the bird again. It was a Brush Wattlebird and well hidden in a hollow at the top of the stump but visible when it put its head up to look at me. It looked as if it might have a nest up there. I have seen, and even more often hear, goannas in the brush beside the track. There are also lots of other big birds that apparently like to make a meal of small birds or eggs. A bird's life isn't easy! Whenever I can, I go out to Inskip Point for a few hours. I especially like the feeling of unlimited space from views where the sea and sky meet out on the horizon. 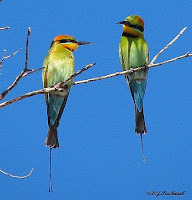 There are always birds out there too – either shorebirds or 'bush' birds. 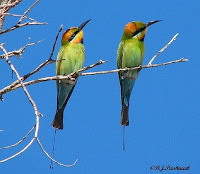 This time I got some great views of Rainbow Bee-eaters. I think this is a particularly beautiful and colorful looking bird. A group of them were flying over head, swooping and whirling. and every now and again coming to rest on the open branches of trees. What were they watching so carefully? Yesterday, I went down to the Noosa River to join the group doing the survey of the birds on the sandbanks at the mouth of the river (see the June 8 post). It was a bright sunny day but the breeze was a bit cold. We saw numbers of Crested Terns, plus over-wintering migratory waders in smaller numbers. Double-banded Plovers from New Zealand are showing some breeding plumage – but it will be darker before they fly back to New Zealand in a month or two. However, the best sighting of the day was the Beach Stone-curlews. 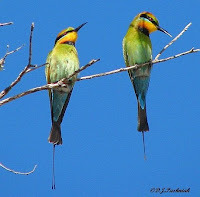 Last year at this time none of these birds had been seen on the Noosa River for some time. This bird is listed as ‘vulnerable’ under the Nature Conservation Act in Queensland, and 'threatened' in NSW. It was about three months after the Noosa Council closed access to one of the larger sand banks for the summer months that we first saw the birds sheltering on this sand bank under some she-oaks. This photo was taken at that time. 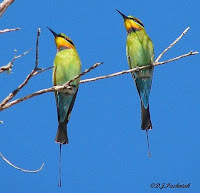 Since then we have seen these birds every time we have done a survey on this part of the river. They seem to be using this larger sand bank and also a much smaller one that has a small dense growth of trees and low growing vegetation where they can hide. We are hopeful that the birds will be here permanently and that they may even breed during the summer. The rest of the river is still being used by all the many people who enjoy the Noosa area. This was the photo I took yesterday with the birds sheltering in the shade of some trees. I frequently travel by Somerset Dam. This dam is one of the water storage areas that help to supply the Brisbane area. The lake constantly changes color with the change in the color of the sky. Bright sunny skies and a bright and peaceful lake. 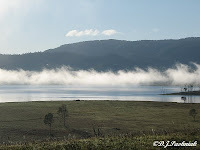 A misty morning and a brooding lake. Over the last few days I have been observing some of the wildflowers in the wallum. Over the next few months different species come into full bloom. By summertime the flowering season will have mostly finished. I am not an expert with the names of these flowers. Mostly I am just happy to admire them and take photos. Some of them have wonderful perfume that scents the surrounding bush while others have such delicate perfume that it is hard to detect. I hope this will be the first post of a series about wildflowers in my area. Please correct any mistakes that I make – that is the only way to learn! This flower picture was taken down at the Seary's Creek Picnic area. There were massed plants blooming in sheets of golden colour. Much of this area is damp and even swampy. (I think the plant is Dillwynia floribunda.) N.B.Thanks to the folks who made suggestions. 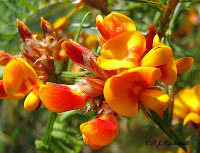 I have done some checking and would now ID this plant as Pultenaea paleacea. 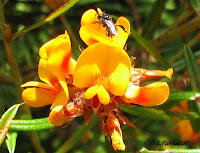 As to the little nectar eating insect – I think it is possibly a native bee. Thanks to the other Australian nature bloggers who have made me interested in photographing “bugs and bities”! This flower comes from a different habitat – up on a ridge where it is drier. 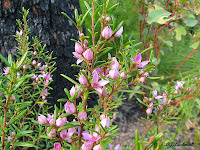 It was identified for me when I first came to this area as Boronia rosmarinifolia – or Forest Boronia. It is not a very common species and I know of only two places in my area where it grows. This is a follow-up to the previous post and my first attempt to get a video onto my blog. Hope it works! 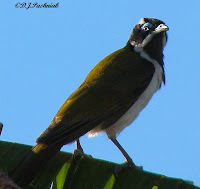 It is a video of the very noisy juvenile Blue-faced Honeyeater that is still calling for attention from the adult. Yesterday the predicted cold weather arrived from down south. Before the sun rose there was even a touch of frost on some dry grass next door. When the sun got up high enough to warm things up a little, every bird in the neighbourhood seemed to want to comment on conditions. The Rainbow Lorikeets were around and as noisy as they usually are. I heard Noisy Friarbirds and had a brief look at some Spangled Drongos before they flew off. The Figbirds were making a lot of noise in both the big pine tree next door and also out on the power lines beside the road. 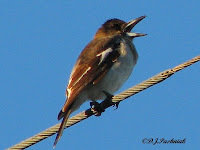 A juvenile Pied Butcherbird joined the group on the wire. 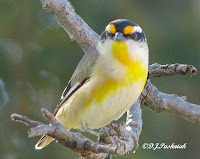 The noisiest of all were the Blue-faced Honeyeaters. One juvenile, especially, sat and simply screamed for some adult to come and feed it. As soon as it had been fed it started the same noisy behavior again. A Kookaburra was sitting in the big pine tree next door and apparently objected to the noise. It hopped closer to the noisiest youngster in the tree – and was immediately mobbed by a whole group of birds until it flew off with a disgusted squawk. The Blue-faced Honeyeaters are such aggressive birds. I have frequently seen them mobbing and chasing off both cats and dogs. I went out today with friends to do the July wader count for the QWSG. It was a nasty blustery cold day (for southern Queensland that is!) Along the Tin Can Bay foreshore there were very few waders as it is mid-winter and only juveniles and some old birds over-winter here. Gull-billed Terns are back after breeding in inland areas during the summer. There was also a small flock of Bar-tailed Godwits with their bills tucked back under their wings. A Caspian Tern and some Silver Gulls stood at the edge of the water with them. Winter flowering Gums and Paperbarks were still in full flower and the small nectar feeding birds were all among them. However, with the blustery conditions they were very hard to see in the tops of the trees. Coastal she-oaks (Casuarina equisetifolia) line the shore at a number of places. Today we heard Mistletoe birds and then found that the mistletoe plants in these trees were also in flower. These plants mimic the host tree so that they have have similar shaped needles (leaves). 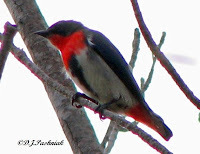 The little male Mistletoebird (Dicaeum hirundinaceum) came down quite close but the trees were short and shrubby and there was plenty of cover to keep me from getting good photos of the bird. In the end the only clear photos were ones taken looking up and against the light. I shall try again later and hope for better conditions. Yesterday I visited relatives in Esk. Next door to their house is a vacant block of land and at the back of it a big Silky Oak tree. In the time that I was there this tree provided cover for a lot of different birds but most of them were well out of sight in the upper branches of the tree. The little Striated Pardalotes (Pardalotus straitus) however called from high in the tree then came down and sat on branches only a few meters above my head. They seemed to examine me as closely as I was examining them. 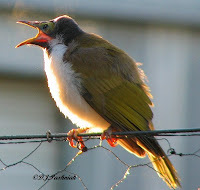 Finally one of the pictures I took showed a bird with its mouth full of tiny pieces of what looked like grass. Then, as I watched, the bird flew down below the retaining wall which was right at my feet – disappeared for a minute – then reappeared without the grass in its mouth and rapidly flew away. I went down below the retaining wall and discovered this knot hole and hole in the bank behind it. Pardalotes make their nest hole in a bank but this one is certainly more secure than most. 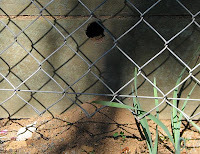 It has fence wire in front of the retaining boards and then the hole in behind that.